Calculating the weight of precious metals can be tricky. There are actually a few different units of measure that convert to different figures and if you need to convert one unit to the other in a hurry, then the Precious Metal Weight Calculator Template has you covered. Don’t worry if you’re not a math person, this template does all the work for you in a heartbeat. Just enter the information listed below and the template will provide you with the data you need to get back to the important things. Whether you sell or trade precious metals, this template has something for you. Downloading the free template file to your computer is as easy as clicking the link at the bottom of this page. Once you have your document open, follow along with this guide to learn how to use it. There are three different parts to this template. 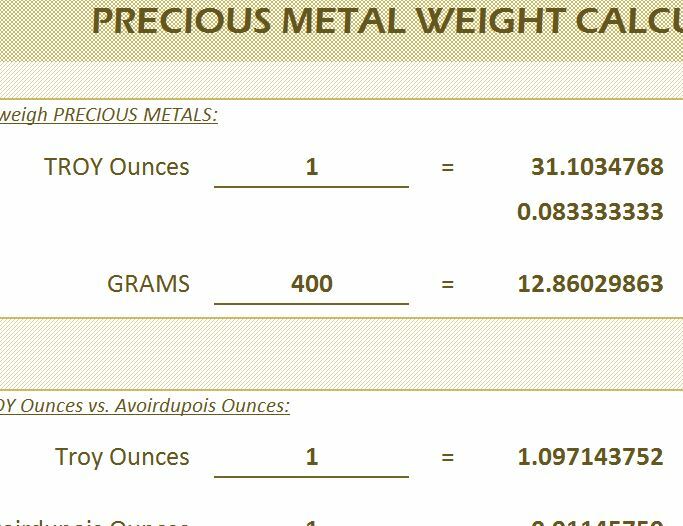 At the top of the document, you can convert grams to TROY ounces (common unit of measure for precious metals). Simply enter the grams of your metal into the indicated cell and watch as the template gives you the TROY ounces in the column to the right. The second column employs a different system of measurement for precious metals, Avoirdupois ounces. This template makes the conversion from TROY to Avoirdupois ounces. Simply follow the same set of instructions you did in the previous table and apply that here to get your conversion. The third and final table is for calculating from TROY pounds to Avoirdupois as well, making this template the ultimate tool for people that work with precious metals. Multiple conversions tables to stay organized. Easy to enter your values quickly.